Electromagnetic interference (EMI) that is generated by high frequency weld equipment can often play havoc with other welding equipment, such as cameras, by creating electromagnetic induction in the circuitry of the cameras. Often the electrical disturbances that occur create a noisy camera image, interrupt image data acquisition or generate continuous lines running through the image. In xtreme cases, it can stop the cameras from functioning altogether. 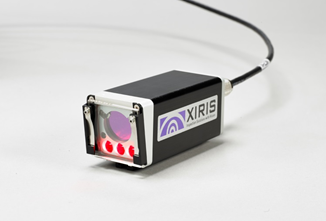 During extensive testing in the field, Xiris XVC weld cameras have proven themselves to be immune to the EMI that is generated by high frequency weld equipment. EMI immunity has always been a problem identified by the industry when using cameras, so Xiris took this into consideration when designing the XVC camera family. The camera is an all digital design, rather than the analog design common on most other weld cameras. The result is that many problems resulting from outside interference are eliminated, allowing for excellent image stability and cable lengths of up to 100 m. As part of that design, the camera housings have been extremely well shielded and grounded, eliminating any stray electrical noise. The XVC weld cameras were extensively tested during the design/build process whereby extreme ranges of frequencies and power levels were used, including some of the harshest welding conditions, such as high power GMAW welding tests, with power approaching 1000A. 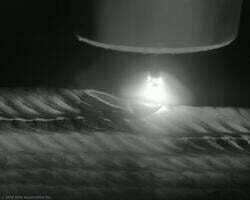 During those tests, the XVC weld camera cables were stretched parallel to welding power lines, wrapped around welding power lines and laid on/over/in grounded equipment, all without significant degradation of the camera image. The Xiris XVC weld camera is now widely used on manufacturing floors running in some of the most challenging welding environments, including alternating polarity GTAW, high powered GMAW and Plasma processes, providing clear images to operators as far as 100 m away from the weld head. for dozens of examples of the camera in action. With the advent of high dynamic range weld cameras such as the Xiris XVC-1000, images of welding processes can be made with enormous ranges of brightness. As a result, it is now possible to monitor and record good quality video of most welding processes using an HDR camera. With good quality images of the weld pool, arc and seam, the next logical step is to incorporate image processing into the camera system to extract additional information to help operators better control the welding process. One of the most basic tools for image processing is a LightMeter. The LightMeter tool from Xiris provides statistical information about the pixel values in an area of interest. It can be used as an overall measure of the intensity of a weld process, detect part or feature presence, or be the first step in performing powerful image processing on an area of interest. Median – the brightness level that separates all the pixels in the area of interest into two equal halves. Mode - the pixel brightness level that appears most often in the area of interest. Minimum - the value of the darkest pixel in the area of interest. 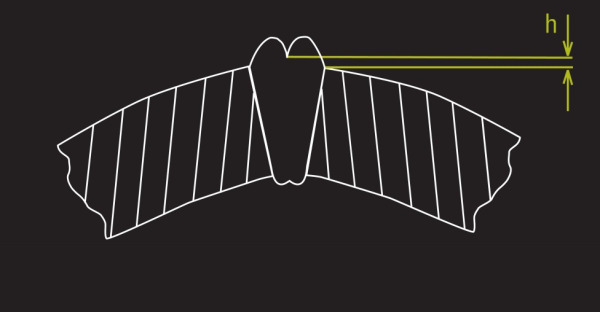 Dark Tail – the pixel value at which a specific percentage of the total number of pixels in an area of interest are found to be darker. 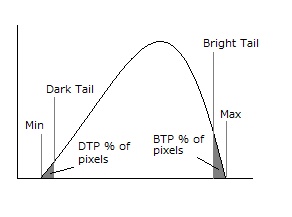 Bright Tail - the pixel value at which a specific percentage of the total number of pixels in an area of interest are found to be brighter. Maximum – the value of the brightest pixel in the area of interest. Standard Deviation – the amount of variation or dispersion of brightness levels of all the pixels in an area of interest. Sum – the addition of all the pixel values in the area of interest. These measurements can be used as building blocks by users and developers to create automatic inspection algorithms to measure welding features and parameters with the goal of performing a level of process or quality assurance. 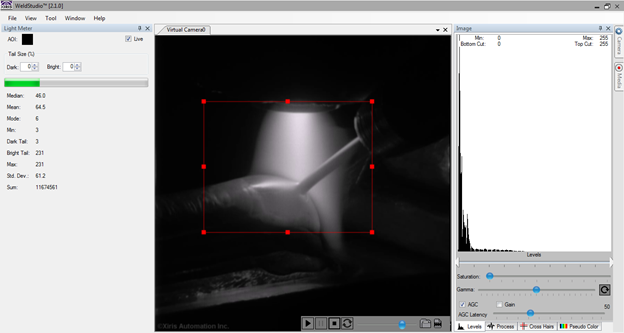 By incorporating image processing tools such as a LightMeter tool into their weld camera systems, machine builders can measure features of their weld processes in a way that has never before been possible. It is now possible to find and measures levels of light across an entire image, or in a region of interest in an image. This can provide information about features of the weld, such as the weld wire, melt pool or weld seam, that could allow for further monitoring or analysis, or form the foundation for seam tracking or weld pool geometry analysis. Attaining a good image of a weld and the surrounding background has been a struggle ever since video cameras for welding became available. The problem has always been the range of brightness that occurs during welding: the ratio between the maximum and minimum light intensity is usually too great for a standard camera to measure properly. Standard cameras on the market today can typically measure about 1,000 levels of brightness between the maximum and minimum light levels in an image. However, in a typical open arc welding environment, there is a brightness range that can exceed 10,000,000 levels of brightness between the brightest portion of the welding arc, and the darker areas surrounding the weld. Using a standard camera to image such a weld will create an image similar to the image below on the left, where the camera sensor will image the scene up to a point and then saturate when it gets too bright. This causes the bright areas of the image to appear as a white blur. To solve this problem, Xiris Automation has developed the XVC-O View Camera that uses advanced electronics with logarithmic sensitivity to be able to see more than 10,000,000 levels of brightness in an image. As a result, more image detail is visible than ever seen before. The detail of the weld arc, the shielding gas, weld pool, torch tip, and weld seam can all clearly be seen. 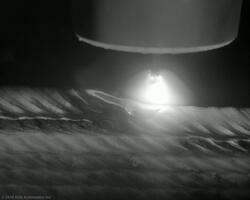 The image below on the right is an image taken from the XVC-O camera of an open arc welding process. The weld arc is no longer saturated and is clearly visible as is the detail of the background, providing better quality information for the weld operator. With the ability to see more detail of the weld arc and the surrounding environment, welding technicians are able to use the XVC-O to better control their welding processes through better quality assurance and process feedback. To see examples of the video quality possible with the XVC-O across a variety of welding processes and materials, please see our Weld Video Library here. Recent advancements in machine vision technology have made a new type of inspection able to see defects related to the forming and welding area of a tube or pipe. The result is improved quality assurance and process control on the production line. The new type of inspection device is a laser-based triangulation system that measures the outside contour of a tube or pipe in the vicinity of its weld. Typically NDT systems are placed at the end of a production as a final check. However, the laser inspection system can be placed directly after the weld box. This system can let operators know what is changing in their welding process, allowing them to perform corrective action before significant scrap occurs. This capacity is especially helpful for one of the most common defects found across all types of Tube manufacturing: Tube Scarf defects. In certain situations on ERW/HF tube and pipe production lines, there is not enough space to perform the Non Destructive Inspection (NDI) measurements right after the weld box because the scarf tool (used to remove excessive bead from the tube) is placed directly after the weld box. In such situations, the measurement process must be made after the scarfing tool, measuring the flat area of the tube where the scarf has occurred. On some production lines, this measurement is essential to identify the shape and profile of the tube, and to understand how it is travelling through its forming process. Known as the scarf width, this measurement is defined as the length of the “flat” portion of the tube that appears after the weld bead has been removed by scarfing. Scarf width measurement changes quickly during production, so it is best averaged over a number of inspections in order to make the measurement stable. The Scarf Width, where “w” = the width of the defect. Xiris Automation Inc. has developed a non-destructive inspection system called the WI2000p Weld Inspection System. The WI2000p includes a laser line and a camera whose optical axis is offset to the axis of the laser line by an “offset angle”. The WI2000p creates a visible cross-section of the tube by projecting the laser line on to the tube and capturing an image of the line using the camera. The resulting image shows a profile of the tube surface as if it were cut in cross section. If a tube is ideally round, the laser image will represent a section of an ellipse and any anomaly such as a freeze line defect can be mathematically detected. Overall, laser-based 3D imaging systems, such as the WI2000p from Xiris, offer an excellent measurement option for tube mill owners/operators who want additional, real-time monitoring of weld features. They can be used in a proactive manner, warning operators what is changing in their welding process so that they can perform corrective action before significant scrap occurs And by measuring the outside contour of a weld, laser-based 3D imaging systems can operate on any type of material, regardless of its reflectance or magnetic properties, using a single head to perform the measurement. Typically NDT systems are placed at the end of a production as a final check. However, the laser inspection system can be placed directly after the weld box. This system can let operators know what is changing in their welding process, allowing them to perform corrective action before significant scrap occurs. This capacity is especially helpful for one of the most common defects found across ERW Tube manufacturing: Freeze Line defects in the weld bead. Particularly in Electric Resistance Welding (ERW) or High Frequency (HF) welding processes, incomplete heating of the faces of the parent material can sometimes occur, resulting in a potentially cold-welded joint, which manifests itself as a line or seam extending from the top surface of a weld down into the welded area, in the shape of a sharp valley. Such a defect could indicate major metallurgical or structural problems in a weld, such as cold welding or improper forming. 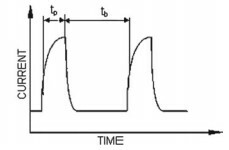 It can very often be a point of a major failure of a weld in high-stress applications because the freeze line acts as a crack initiator into the welded material. The Freeze Line becomes a concern to weld operators when it goes below the surface of the parent material of the tube because once the weld bead has been removed through grinding or scarfing, there is a risk that a void of non-welded material could be left behind. The freeze line is measured from the lowest point of any contour in the weld bead to the surface of the parent material as defined by the ideal circle scribed by the walls of material beyond the weld zone. If the freeze line goes below a pre-defined height, then it is considered a defect. The Freeze Line Defect, where “h” = the height of the defect.